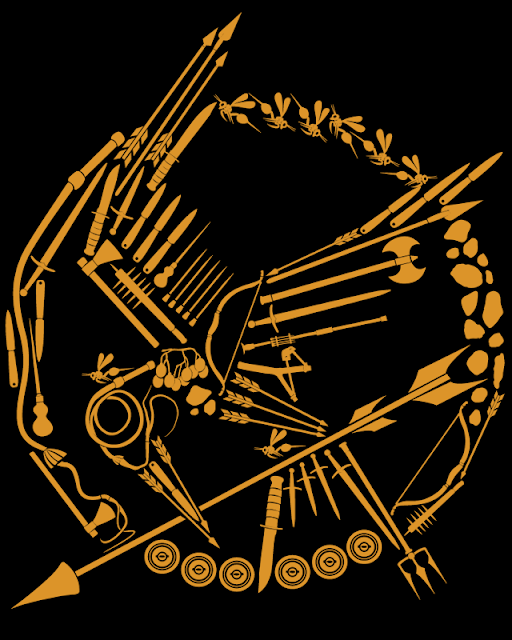 Fruitless Pursuits: Awesome Hunger Games Inspired T-Shirt Celebrates Killing Kids! Awesome Hunger Games Inspired T-Shirt Celebrates Killing Kids! The universe's Hunger Games fever is at an all time high! I can't even get hungry right now without making a game out of it! I can't see a small child without throwing a knife! Be sure to read Jacinta's insightful review of the film here, and if you want to wear your fandom on your chest then why not check out this new T-shirt from Bluebutter pop parody tees? Our new pal Steve from Bluebutter was kind enough to share this amazing Mockingjay pin logo made up of Hunger Games certified children killing weapons! Do you recognise some of these munchkin-murderers from the book? Be sure to check out some of the other pop culture inspired designs offered at the site. I think that this is a pretty amazing T-shirt. It would be a shame if someone threw a javelin through it. Oooh, that's gooood. Love the inclusion of Finnick's trident. that is totally sweet. want. Love it! I want one like yesterday! My nephews would love it too. I checked out BlueButter. I'm in love with the Pulp Fiction t-shirt. Oh my God, and the Star Wars one (Arcade Vader)! Hilarious!